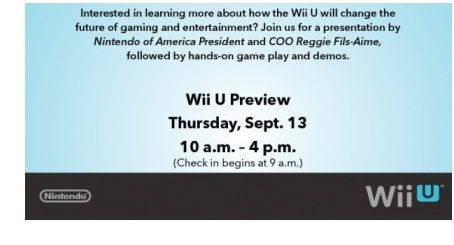 Nintendo have announced a 'Wii U Preview' event to be held on Thursday 13th September in New York. During this event it is widely expected that the actual release date and price of the Wii U will also be announced with different regions worldwide getting staggered release dates. The line up of launch games will also be eagerly awaited by fans together with what will be actually included with the console. Nintendo America's Chief Operating Officer, Reggie Fils-Aime, will be presenting the invite only event which is billed as "how the Wii U will change the future of gaming entertainment". Nintendo's E3 2012 presentation was a bit of a let down for the video gaming fraternity with no great announcements however it now looks like they will soon be given something to get their teeth into. Every other Nintendo event which has been held in New York in the past has ended up with the announcement of a release date and price of a new piece of hardware such as the original Wii and 3DS. Although a few UK retailers have already started taking pre-orders, it is expected that these will officially commence late September.